UNDER ENOUGH heat, atoms start to fly apart. Such is the state of Britain’s political parties as Brexit day approaches. Theresa May, the Conservative prime minister, has long insisted that Britain will leave the European Union on March 29th, deal or no deal. This week she conceded that Parliament would be allowed to request more time after all. Meanwhile Jeremy Corbyn, who has been resisting calls from Labour members to back a second referendum, said it was now the party’s policy to support one. 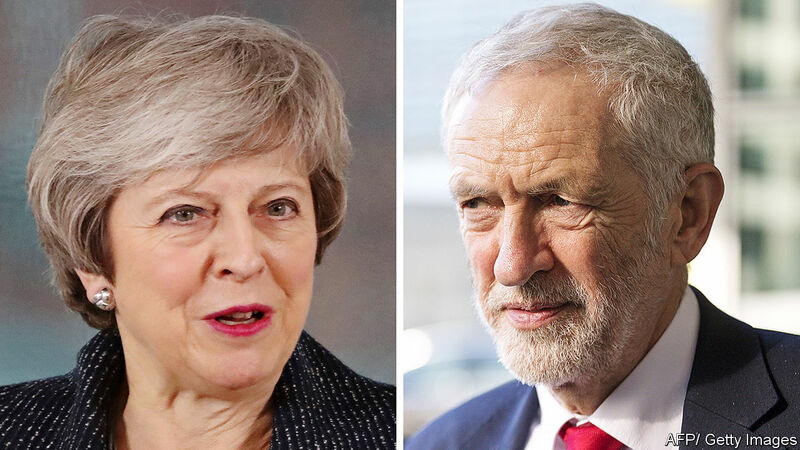 The about-turns show the extent to which both leaders have lost control of their own Brexit policies, and their parties (see article). Their change of direction is welcome. Labour’s reluctant backing of a second vote has many strings attached, but Mr Corbyn has at last conceded the principle that the public should have the right to approve or reject any deal. And Mrs May’s volte face makes it highly unlikely that Britain will crash out of the EU without a deal in a month’s time. Yet no one should get too excited. This week’s developments do not get rid of the cliff edge towards which Britain is heading—they only push it back, and not very far. Mrs May said that the Article 50 talks could be extended only to the end of June at the latest. That would buy just another three months. The prime minister seems determined to persist with her tactic of pretending to renegotiate her deal with the EU, running down the clock in the hope that MPs will feel forced to approve the deal as time runs out and the cliff edge draws nearer. This strategy has a poor record. Mrs May originally planned to present her deal to MPs in December, but pulled it when it became clear they would reject it. In January, when time was already tight, they defeated it by a record margin of 230 votes. The deal was supposed to return to the Commons this week for another attempt but the prime minister backed down again, fearing a second rout. She now says MPs will get to vote on her deal by March 12th, just 17 days before exit day. They may yet cave in; some hardline Brexiteers are already hinting that they might rather leave on time with Mrs May’s deal than delay Britain’s departure, at the risk of ending up with another referendum. But other MPs, far from feeling more cowed as Brexit day looms, seem to be growing in rebellious confidence. The prime minister has kicked the can down the road so many times. How many believe her when she now says that the end of June will be the final deadline? As Mrs May’s strategy remains unchanged even as her credibility collapses further, the risk is that Britain’s poisonous Brexit impasse simply continues for another three months. That is why the EU should try to push Britain towards delaying Brexit for longer, perhaps until the end of the year. An extension is useful only if Britain uses it to build a Brexit strategy that can command the support of a stable majority of MPs and the public. And that is more likely the more time it has. Holding yet another election might be another way to break the deadlock in Parliament (though polls suggest it might just prolong it). This newspaper has argued that a referendum on Mrs May’s negotiated deal would be a better way to achieve such agreement. Either of these radical courses would take longer than three months to succeed. A long extension would carry risks. Some Tories are itching to topple Mrs May; if they did, her replacement might turn out to be even harder to deal with. And if Britain remained in the EU beyond the end of June then it might be legally obliged to take part in this spring’s European Parliament elections, which it is not currently scheduled to do. Yet even as legalistic an institution as the EU ought to be able to find a way around snags such as this, if the prize is a better Brexit outcome for all parties. When, as seems likely, Mrs May asks for more time two weeks from now, the EU should press her to accept a long extension. And Mrs May should welcome its offer.